Gurgaon-based GoldVIP Technology Solutions Pvt Ltd, which runs a mobile-based marketing and customer rewards management platform Crown-it, has raised $5.5 million (Rs 34 crore) in Series A round of funding from Accel Partners and Helion Venture Partners, it said on Tuesday. 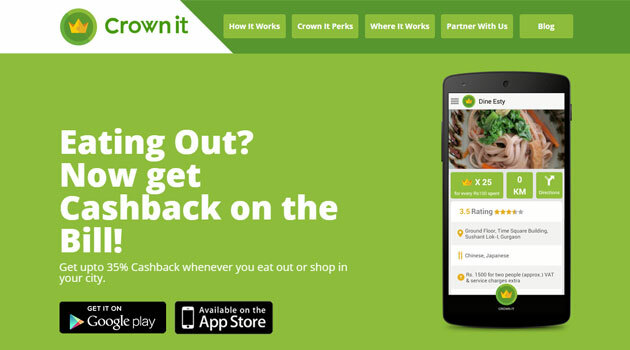 Crown-it offers exclusive cash back offers at restaurants and outlets in addition to providing technology to local businesses to run marketing programs. The company plans to use the funds to enhance its technology platform, expand to new cities and add more product categories. Founded in March 2014 by Delhi College of Engineering alumnus Sameer Grover, Crown-it operates only in Delhi-NCR currently and claims to have a user base of 150,000 on its Android and iOS apps. The company plans to grow to 20 million user base in three years across 25 cities in India. "We help users discover and experience places which are relevant to them and around them, besides getting rewarded for visiting those merchants. For merchants, we give them measurable ROI marketing channel. We charge them on the business we actually give them," said Grover, founder and CEO of Crown-it. The hyperlocal app allows users to click photograph of the bill, upload it on the Crown-it app as they visit one of the listed outlet and redeem their cash back for shopping, phone bill payment or movie tickets. The Crown-it cash back offer can be availed at a number of e-commerce platforms including Amazon, Flipkart, Jabong and BookMyShow. Basically, Crown-it charges merchants a marketing fee for sales driven at the outlets, and shares part of the fee with consumers as cash back. Crown-it is targeting F&B, health, beauty & wellness and a number of local merchants in categories like florists, gift shops and local kirana stores. Currently, the app has listed around 5,000 restaurants in Delhi and is set to launch additional categories in a number of cities. It had earlier raised angel funding from a number of individual investors. Other major players in the cash back, deals and discounts space in India are cashkaro.com run by UK- and India-based Pouring Pounds Pvt Ltd, Hyderabad-based Shop Pirate, Pennyful.in, GoPaisa.com and topcashback.in. Accel Partners Crown-it GoldVIP Technology Solutions Pvt. Ltd. Helion Advisors Pvt. Ltd.